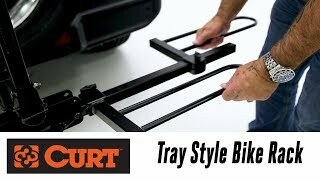 Come inside the Total Truck Centers™ garage as we take you through the installation of some of today’s hottest truck accessories In this episode, we welcome Keith Gehrke from CURT to the garage and we talk about their Tray Style Bike Rack. 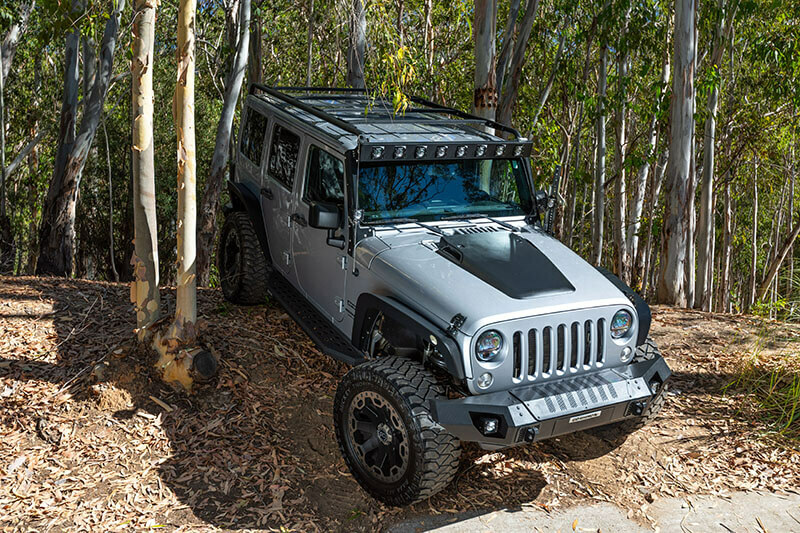 The new Overland roof rack from Go Rhino will help you customize your Jeep Wrangler JL Unlimited for whatever adventure lies ahead of you. These systems combine overhead cargo management with rear taillight protection and front-facing lighting options. 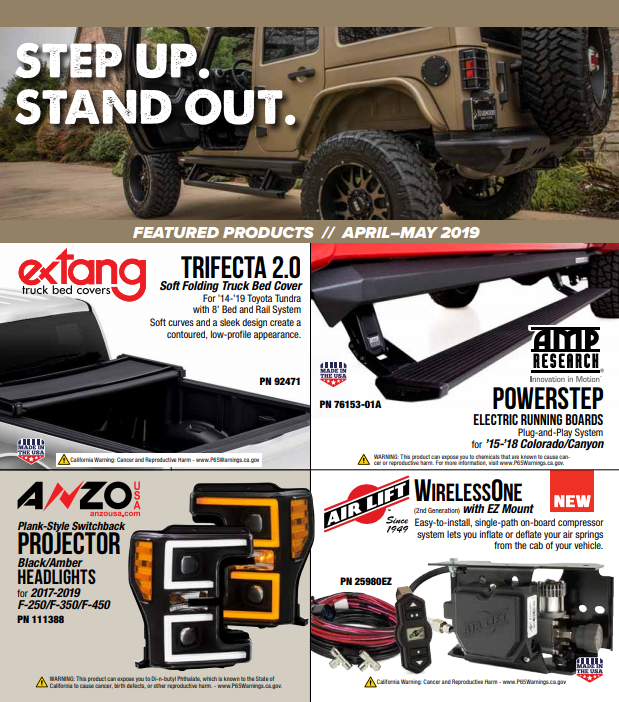 Attaching to a Go Rhino Windshield Light Frame in the front and taillight mounting areas in the rear, the body-to-body mounting improves load-displacement integrity and facilitates quieter driving and wheeling. 59941500T: Allows for the installation of a 50” light bar (includes rack and windshield frame). 59941343T: Allows for the installation of a 30” light bar and four 3” cube lights (includes rack and windshield frame). 59941423T: Allows for the installation of a 40” light bar and two 3” cube lights (includes rack and windshield frame). 59948300T: Allows for the installation of eight 3” cube lights (includes rack and windshield frame). The Duralux Mini Flush Kit is Vision X’s powerful answer to small fog/reverse lights. Boasting a sleek, compact 2.75” housing, each kit features 8 Cree LEDs that push 4,200 lumens—ranking them among the brightest lights in their class. 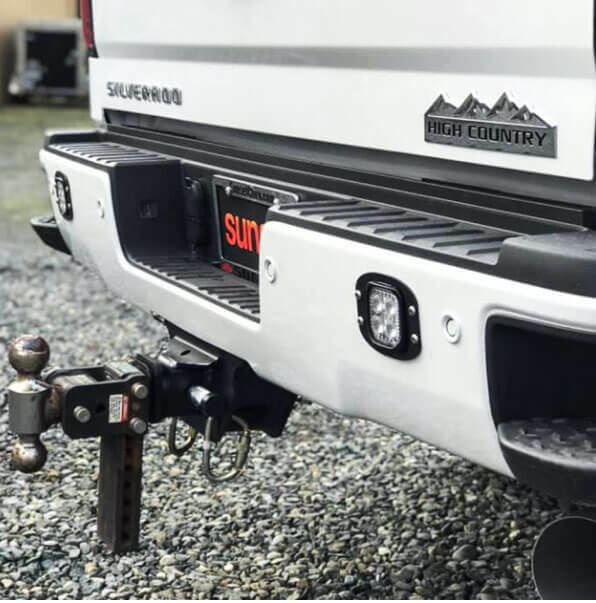 The newly designed Vision X flush-mounting brackets fit perfectly into any aftermarket bumper outfitted with 3” square light pockets. Don’t have precut pockets? Vision X even includes a template for easy cutting and installation. Users can choose between the Dura M4M (9933108), with mixed 10- and 20-degree optics to produce a forward-facing driving beam, or the Dura M460 (9933115), which produces a 60-degree flood beam ideal for reverse/scene lighting. Designed to fit common 3” square pockets. Forward-facing driving beam and reverse/scene flood beam options. Wiring harness with lighted rocker switch. Cutout template for applications that lack pockets. 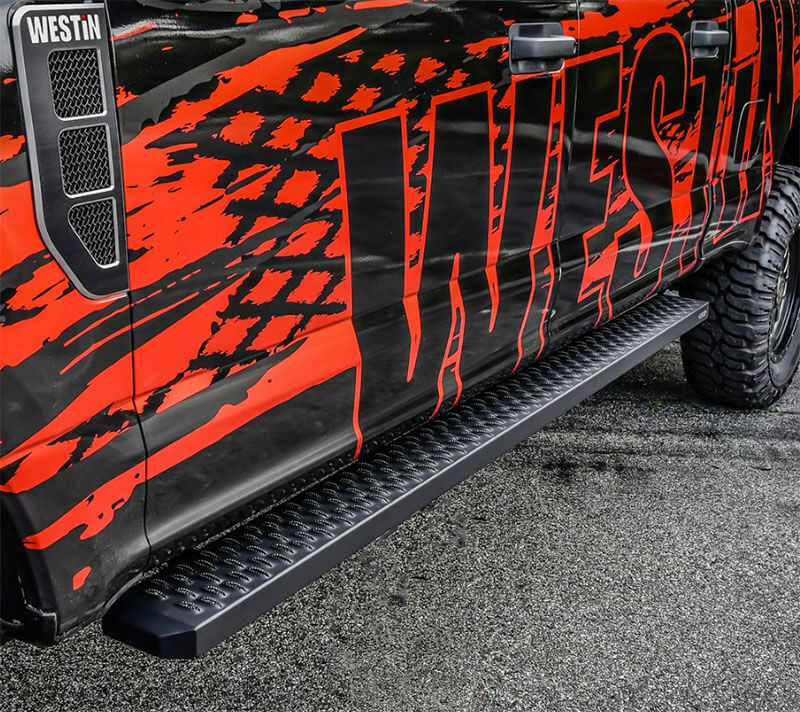 With their 1/4” high-punched tread with unique serrated edges, Grate Steps running boards from WESTiN Automotive take aggressive style and all-weather traction to new heights. The 6.25” surface offers both a sure step up into your cab and helps keep it free from dirt, snow, mud, and other remnants from your work day. Their stylish profile includes fully formed and welded ends, die-cast riveted WESTiN logo badge, and an e-coated base coat and textured-black finish that provide terrific corrosion protection. The one-piece steel design is ideal for a variety of applications, from commercial and construction to vans and utility use. Available in seven universal lengths (54”, 68”, 75”, 79”, 83”, 86” & 90”), with vehicle-specific mount kit required (and sold separately). E-coated, textured-black, one-piece steel construction. Quarter-inch-high, serrated punched tread for traction and boot cleaning. Die-cast riveted logo badge and fully welded ends. 6.25” step surface for a confident step up. Vehicle-specific mount kit required and sold separately. Automotive take aggressive style and all-weather traction to new heights. 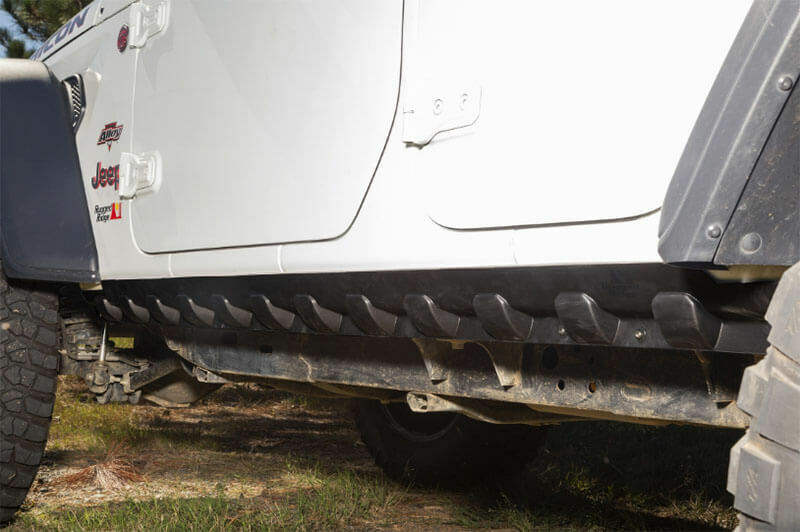 Armor up: Body Armor rocker guards from Rugged Ridge are a simple, stylish, and affordable way to protect the lower body pinch seam of your 2018–2019 Jeep Wrangler JL Unlimited. Enhancing your rig’s profile with an impressively aggressive off-road design, the 11651.61 Body Armor is constructed from impact-resistant polycarbonate and goes on with no drilling. Available in an attractive matte-black finish to complement OE flares and bumpers. Sold in pairs and also available for two-door JLs. For 2018–2019 Jeep Wrangler JL (four-door). Adds style and protection to your lower pinch seams. Available for two- and four-door models. Installation time: < 1 hour. 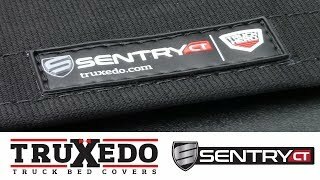 Come inside the Total Truck Centers™ garage as we take you through the installation of some of today’s hottest truck accessories In this episode, we install the Sentry CT Rolling Truck Bed Cover from TruXedo on a 2019 Toyota Tundra.